All transactions are safe and secure with a reliable history in online purchasing behind each of our associates. Buy the Adult Care Bears Costumes to own Care Bears clothing and merchandise. Spread some cheer and bring smiles to the faces of everyone around you with these adult Care Bears costumes that are the perfect Halloween outfits for fans of the fun loving characters. 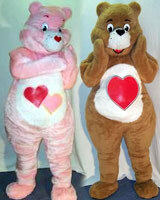 Cara Bears costumes for adults include Love-a-Lot, Tenderheart, Birthday, Funshine Bear and others. These outfits are great for birthday parties, cosplay, Halloween or just dressing up for fun. All that you'll have to do is find a rainbow to slide on. In addition to the Adult Care Bears Costumes above, browse the Care Bears Clothing Gallery for more apparel like men's and women's clothes, kids shirts or hoodies.